Many product markets have gone global already. Others are following. The globalization of markets is well understood by business. It has also come to dominate the economic policy agenda of nation states and supranational organizations. They all compete for inward investment to create and preserve employment opportunities. 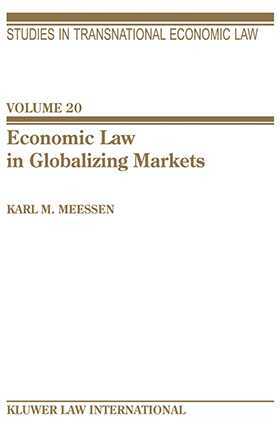 Economic law is one of several parameters in the global competition of systems. This study takes note of that new and additional function of economic law. Part I sets out to examine the making of economic law by states, by business and by international and supranational organizations. Part II discusses some of the main rules of substantive economic law divided into chapters on market law, transactions law and property rights law, and Part III addresses key issues of enforcement by the executive branch, on the one hand, and by the judiciary and arbitral tribunals, on the other. Each of the 32 chapters contains an essay on a current cross-border related problem of economic law, often as reflected in recent case law. Nearly 300 cases are discussed, or at least referred to, in that way. They were selected from international case law and from cases decided by EC, US and German courts (and courts of ten more countries) as well as by ICC, ICSID and other arbitral tribunals. The introductory notes to, and summaries of, the various parts and chapters integrate economic and political theory, and provide the common thread. The overall conclusion is to advocate a transnational approach, problem oriented and cutting right across all layers of sources of law (international, supranational, national and transnational law). It distinguishes neatly between public and private law aspects of economic law but decidedly treats them together. The book is of interest to academia and practitioners, both for references to current problems and for a vue d'ensemble. Advanced students might use the book to understand the logic of today's economic law. In addition to decades of research in international economic law, the author capitalizes on his exposure to a wide array of practical issues as well as on six years of English language teaching in Geneva. Introduction. Economic Law and the Competition of Systems. Part 1 The Institutional Duality of Economic Law. I. States on the Retreat. II. Business and its Law-Making Agents. III. The Rise of Governmental and Non-Governmental Organizations. IV. Summary and Outlook: Complexity Unreduced. Part 2 Mutual Adjustment of Economic Laws V. Market Law. VI. Transactions Law. VII. Property Rights Law. VIII. Summary and Outlook: Facing the Internet Economy. Part 3 Conflict and Coperation in Cross-Border Enforcement IX. Multiple Roles of the Executive Branch. X. Judicial and Economic Sovereignty. XI. Culture of Cross-Border Arbitration. XII. Summary and Outlook: Toward Due Process Worldwide. Conclusion. Transnational Theory of Today's Economic Law.